Is it time to make a birthday banner for someone in your life that deserves to have their annual recognition day marked by a celebratory collection of friends and family? Hopefully your party, and the giant birthday banner that towers over the room where it’s being held, won’t be as awkward as that first sentence. The fact is, making your own banner is a project you can handle with more than a few common DTP software programs and online resources designed for this purpose. This article will teach you exactly how to go about designing a banner that you envision and get it to your printer (after which, some assembly is required). But it’s a relatively easy project, and in an effort to make it even more of a seamless task, this tutorial covers a few different options depending upon your preference and software knowledge. Whether you want to unleash some creative urges and personalize your elongated sign with great detail (colors, styles, fonts, borders, and the like), or simply print out the ready-made, page-sized letters available in many places and programs, you’ll find that option below. So before you choose the method you like most from the list below, take a moment to congratulate yourself too. Because it’s a nice thing to take the time to help plan a party for someone, and it will probably mean a lot to them. If Adobe Photoshop Elements is the DTP software that you happen to be a whiz with, then you can certainly harness the banner-building capabilities of this image editing software to get the job done for you. Since this tutorial was already skillfully presented by one of our writers in a piece called Recognizing Someone with a Professional-Looking Banner from Photoshop Elements, there is no need to cover that ground again. With this program you have a lot of creative leeway since you have the ability to upload artwork or images onto the banner. If you want to use Microsoft Publisher, the easiest way to create a program in this popular DTP program would be to use a template that has the design work already done for you. You can find template offerings on Microsoft Office Online. For instance, this one here, is a rather simple slanted design, while this Publisher template has a stylish border with cakes and hearts. If you have an older birthday candidate (who still has a sense of humor) this over the hill banner might be a good choice. Once you download a template, all you do is personalize the text to reflect the right name and tweak anything else you want to utilizing the Publisher functions you’re familiar with. File> New Publication task pane>New from a design>Publications for Print>Banners. From the Preview Gallery you can then click the banner design you like. From here you can tweak height, width, colors, fonts, and of course insert the text to reflect the birthday boy. To print, you must make sure your printer will support banner sized paper. To do so, see what your options are by clicking Page Setup then Printer and Paper to match the dimensions of your banner component to the paper size it’s designed for. If it doesn’t support banner paper you’ll have to change your dimensions to fit the paper size your printer does support. For more on printing, along with trouble shooting, visit Microsoft’s Help Desk. 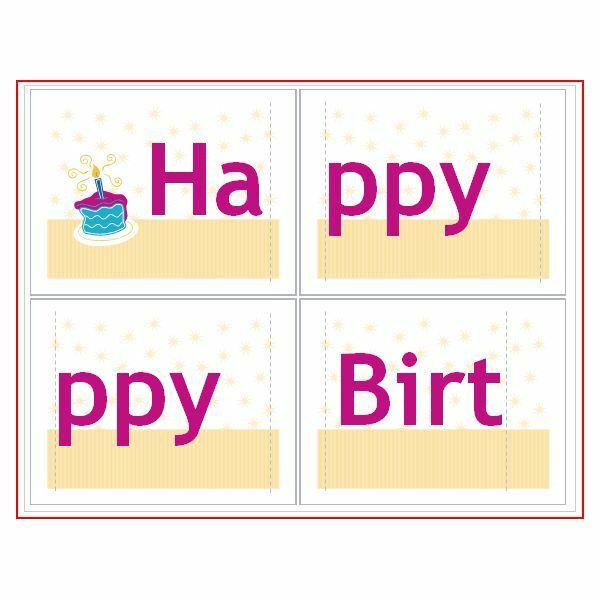 Microsoft Office Online has some excellent birthday banner templates to download and customize in Word. For instance, this one is simply divided onto six standard sheets of paper to make quick work of this task. Printing is therefore a breeze using standard copy paper. There are many more Word templates to choose from. Creating One-of-a-Kind New Year’s Themed Banners has some great tips on the kind of fonts you’ll want to avoid, achieving maximum readability and avoiding distortion. Finally, you have the option of using websites that are party-oriented sources of all kinds of birthday paraphernalia, including banners. For these, you’re really just putting the right name on there and, voila, you’re done. A whole article is dedicated to helping you do it this way in Where to Find Free Printabnle Banners: Five Great Sources. Alright then, that is all the basic direction you will need to get yourself a banner using any of the above methods. Just make sure the size dimensions and color selections of each individual sheet can be printed on your particular printer. Once you have all the components printed, it’s just a matter of assembling it with glue or tape. Keep in mind that some templates require cutting the paper to make it all match properly; so if you don’t want to bothered with that, find another template.